Partially remove the front body side welt along the front pillar finisher. Pull front pillar finisher to gain access to the front pillar finisher tether clips. Cut each tether clip to release front pillar finisher. Release pawls and remove front pillar finisher. 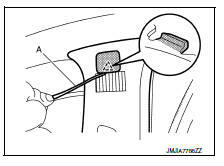 Remove front pillar finisher tether clips from body panel. Always replace tether clips with new ones after every removal. When installing, check that tether clips are accurately aligned with the holes on body panel, then press in. Move front seat to the full forward position. 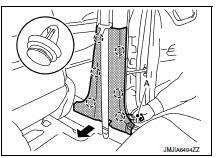 Lift up front end lower of front kicking plate inner while pulling toward inside of the vehicle and release front kicking plate inner pawls as shown. Begin at the front and release front kicking plate inner pawls as shown. 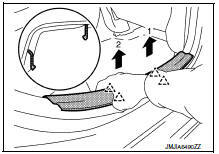 Lift up rear end lower of front kicking plate inner while pulling toward inside of the vehicle and release front kicking plate inner pawls as shown, then remove front kicking plate inner. 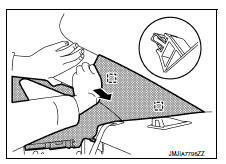 Lift up front end lower of rear kicking plate inner while pulling toward inside of the vehicle and release rear kicking plate inner pawls as shown. Begin at the front and release rear kicking plate inner pawls as shown. 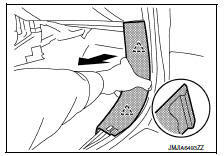 Lift up rear end lower of rear kicking plate inner while pulling toward inside of the vehicle and release rear kicking plate inner pawls as shown then remove rear kicking plate inner. Remove front kicking plate inner. 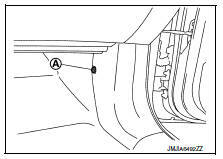 Refer to INT-24, "KICKING PLATE INNER : Removal and Installation". Remove dash side finisher clip (A). 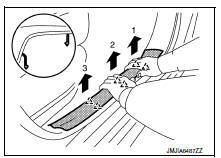 Pull back dash side finisher as shown to release dash side finisher pawls and remove. Remove dash side finisher. 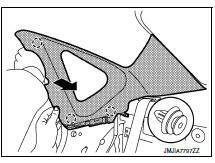 Refer to INT-26, "DASH SIDE FINISHER : Removal and Installation". Remove front body side welt. Use care not to stretch out welt if it is to be reused. Remove rear kicking plate inner. 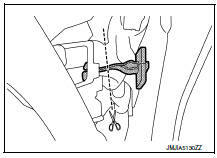 Refer to INT-24, "KICKING PLATE INNER : Removal and Installation". Remove rear body side welt. 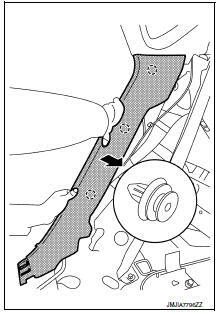 When removing, always use a remover tool that is made of plastic to prevent damage to the parts. Do not damage the body panel. Remove front and rear body side welts. 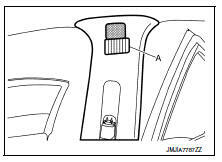 Refer to INT-27, "BODY SIDE WELT : Removal and Installation". Remove center pillar lower finisher. 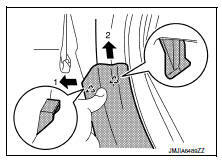 Release center pillar lower finisher clips using a suitable tool (A). Release center pillar lower finisher pawls as shown and remove. Remove center pillar lower finisher. 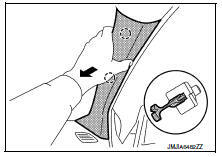 Refer to INT-27, "CENTER PILLAR LOWER FINISHER : Removal and Installation". 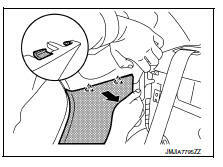 Remove front seat belt D-ring anchor. Refer to SB-8, "Removal and Installation". Remove center pillar upper finisher. 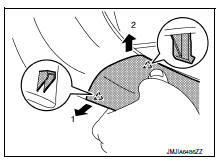 Release center pillar upper finisher cap pawl using a suitable tool (A) and remove. Remove the center pillar upper finisher bolt. 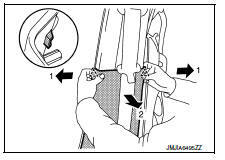 Release center pillar upper finisher lower clip using a suitable tool (A) as shown and remove. Remove rear pillar lower finisher. 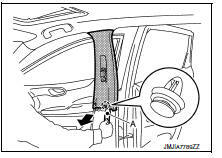 Refer to INT-30, "REAR PILLAR FINISHER : Removal and Installation - Rear Pillar Lower Finisher". Release the clips as shown. Release the metal clips as shown. Pull rear pillar finisher forward and remove. When installing, check that all clips are accurately aligned with the holes on body panel, then press in. 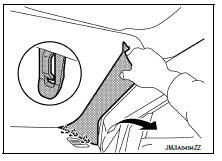 Remove the rear seat bolster. 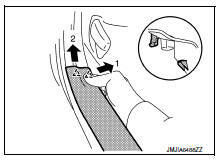 Refer to SE-24, "Removal and Installation - Rear Seat Bolster". Remove the rear kicking plate inner. 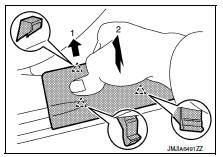 Refer to INT-24, "KICKING PLATE INNER : Removal and Installation". Remove the rear pillar lower finisher. Release pawls at the upper portion of the rear pillar lower finisher as shown. 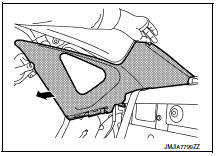 Release clips and remove the rear pillar lower finisher as shown.